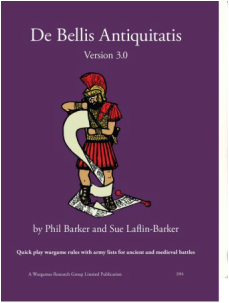 Needing only 12 Elements per side this is a cheap introduction to Ancient & Medieval wargaming. The basic ideas are easy to pick up but subtle in play. A good choice for demonstration games. There is a v2.2+ being developed by a group of enthusiasts. V.3.0 is now generally available. After the first few games the most striking difference is the extended movement. Sadly this set is now rarely played at the club. At first sight these look like the fantasy equivalent of DBA. A closer inspection shows different troop types and mechanisms. 24 points of troops are required with restrictions on the number of 'heavyweights'. Very versatile troop definitions allow the use of rocks, dragons, insects, garden gnomes - in fact anything goes. Occasionally used in public demonstrations but also in competitions (e.g. Recon). Two additional troop types have been suggested by WADBAG - Brutes & Phalanx. The base rules have been recently re-printed (July 2014) with only a few, minor, changes. Low numbers of individually-based 25mm figures are required for this set of skirmish rules. The club now has 5 painted armies, dice, measuring sticks, the main rules plus 2 supplements - "Northern Fury" & "The Raven's Shadow". A third supplement - "Varjazi & Basileus" offers 3 new factions - Pagan Rus, Rus Princes & Byzantine Empire (and some mercenaries). Also a few additional rules. Just out is "The Crescent and the Cross" with a time shift to the crusader period. Not a supplement but a stand-alone set of rules. 6 factions - Crusaders, Saracens, Milites Christi, Mutatawwi’a, Spanish and the Moors. For more information on Saga go to "The Tapestry" website or to the Gripping Beast forum. Also worth looking at is the Renaissance page for: 'DBA-RRR' (12/13 elements), 'New World DBA' (12-24 elements) and 'Conflict at World's End' (12-20 elements).